Sure, you can find strawberries year round, but, even more so than most fruits, they really shine when they’re in season. For those of us in California, the season is here. Be patient in cooler climates. Strawberries are coming your way soon. 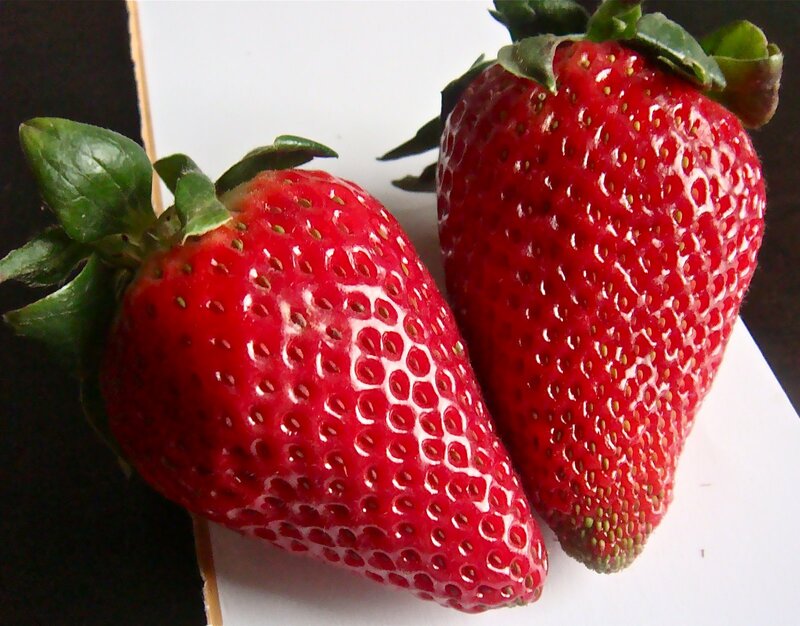 The two most common varieties of strawberry are camarosa and albion. There isn’t much of a difference in taste between the two. Albion is a new variety, quickly becoming the most popular choice for California farmers. All of the vendors who sold them seemed really proud to be doing so. I had a pretty good sampling of both camarosa and albion, and, though I found the albion to have a slightly more balanced flavor, both were very enjoyable. The only other variety I was able to find at the farmers’ market was one called a ‘269’. It was billed as “softer and juicer” than other strawberries. It was. However, the flavor was also softer and less complex than either the albion or camerosa. Make your ’69’ jokes now. Be my guest. Look for berries that are a deep brick red. There should be no traces of green or white at the top- this indicates a berry that was picked before full ripeness. Avoid bruised berries, unless you’re going to eat them immediately. Then again, you should eat them right away- strawberries loose flavor when refrigerated. The best thing to do is pick some up at a farmers’ market, and eat them the same day. I lie. The best flavor comes from growing your own. However, strawberries are fairly difficult to grow, and yields are small. But you should experiment anyway if you have the space. What you should NEVER do is steal another person’s strawberries. Especially if they plan on eating the two small ripe berries in their berry patch right before writing a blog about strawberries. Because that will make a person mad. Mad I say! Ever since I tried to make yogurt, I’ve been thinking about what is worth putting in extra effort and what is not. Generally, I try to make everything I eat from scratch- it’s more satisfying, and nearly always tastes better that way. However, there are times when laziness is rewarded. Such is the case with frozen brown rice. Brown rice isn’t difficult to cook, but it does take some time- about 40 minutes. Now, if you’ve been reading This Man’s Kitchen for awhile, you know I’m not afraid of slow cooked food. However, why take 40 minutes to do something when it can be done in 3 minutes. Three minutes. That’s all it takes for frozen brown rice. So, clearly the frozen stuff wins the time contest. What about quality? Well, I have no problems here, either. The master scientists who designed the freezing apparatus (grains look individually frozen) and the steamer bag deserve some sort of prize. I never thought I’d say this, but: Frozen microwavable rice is at least as good as the rice I’d make on my stove top. Wow. The rice is organically grown, which is a nice bonus. 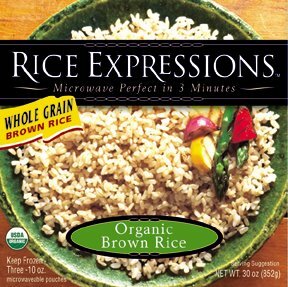 You can find frozen brown rice at both Whole Foods Market and Trader Joe’s. Currently, they sell for $4.69 at Whole Foods. With 6-9 servings per box, it’s a pretty good deal! The only downside- the unfortunate name of the brand sold at Whole Foods. It’s called “Rice Expressions”. Who was the genius that thought of that?! Lame. In other news, there is strong evidence that First Lady Michelle Obama is a HUGE fan of This Man’s Kitchen. 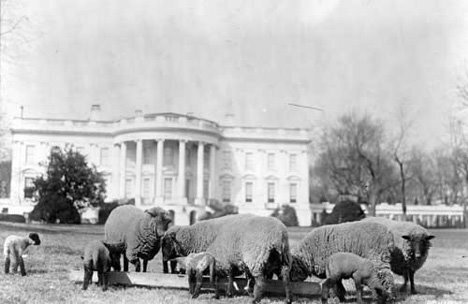 Alice Waters spent over 20 years lobbying for a White House vegetable garden. 20 years! I write about it on a Monday, ground is broken on the garden just a few days later. 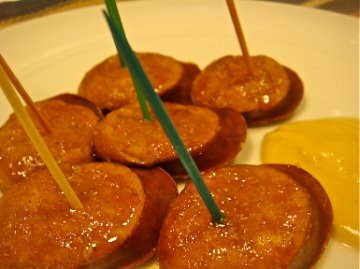 I’m told that this quick and tasty appetizer is popular among the Russian folk. I can see why- it’s complex in flavor, easy to make, and really good. Slice the kielbasa at a 45 degree angle. Top with a sprinkling of brown sugar. Bake at 450 for about 8 minutes, until sugar is melted and top is golden brown. Serve with mustard. 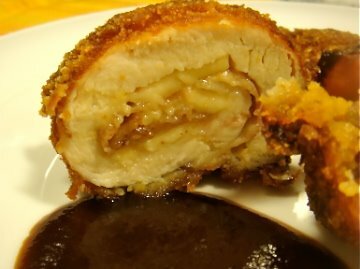 Since this dish is so simple, quality of ingredients is extra-important here. Take the time to read the label. Last night, 60 Minutes aired a generally nifty segment on Alice Waters. Sadly, the piece occasionally veered into the strange thought that eating wholesome and organic food is somehow an elitist practice. Chef Waters did her best to explain why it’s actually the opposite- that Eating Good Food is as down to earth as can be. Literally. That’s why we should all support the effort to have a Presidential victory garden at the White House. Not too long ago, it was considered both patriotic and practical to grow a garden. The President and First Lady have a wonderful opportunity to show Americans that choosing to eat wholesome, chemical free food is a choice we all should make. To learn more about why this is necessary, and how it could be done, check out Michael Pollan’s brilliant NY Times article. To take action, sign the WhoFarm’s petition. It’s hard to believe that I’ve been gardening for a year now. What started as a solo tomato plant in a large pot, turned into a homemade garden in an overturned storage shed, and has now become a stealth planting project all over my (landlord’s) yard. You know you’re obsessed when you’re planting a handful of shallots in between your landlord’s begonias. If you’ve never gardened before, I’d encourage you to give it a shot. It’s insanely rewarding to eat something you’ve grown yourself. Sure, it takes a little patience. And a little work- there is watering involved, sometimes every day. But, in the long run, it’s not very difficult. You’ll save money on food, too! The best thing to do is to start with tomatoes. If your recent experience with tomatoes has been the pale orange slices of watery goop that was thoughtlessly added to your burger, you’re in for a treat, Buster. Tomatoes, being soft and squishy by nature, aren’t designed for travel. So grocery store tomatoes have been bread for toughness, not flavor. They are also picked before fully ripe, again diminishing the flavor. When you grow your own, you can choose varieties designed for maximum flavor, and pick them when ripe! They’re also remarkably easy to grow. Even if you’re stuck for space, you can grow tomatoes. 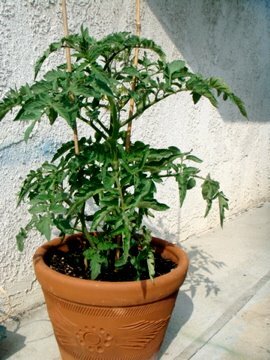 All you need is a decent sized pot, some quality organic compost or potting soil, and a seedling. Seedlings can be found at your local garden center, or, even better, at a farmers’ market. The University of Georgia has a lot of information, but don’t feel like you need to be so scientific about it. Good dirt, careful monitoring, and patience will do the trick. There are hundreds of varieties to choose from. naturalhub.com, a great resource in general, provides an excellent list of options. Heirloom tomatoes have a wide array of flavor & color, but can be more difficult to grow. 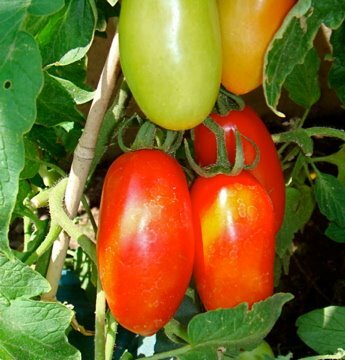 Hybrid tomatoes are bred for greater pest resistance and predictability. San Marzano- an Italian plum tomato, used for sauce. 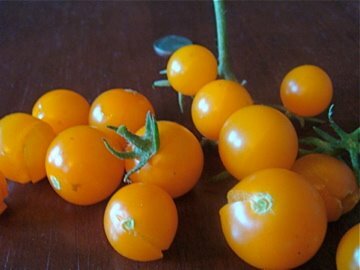 Sun Gold: An orange cherry tomato. Perfect balance of acid and sugar. They grow very TALL. Early Girl: An quick growing, medium sized fruit. Good all purpose flavor. Works great in a pot. Brandywine: A popular heirloom beefsteak tomato. Amazing flavor- tastes how you think a tomato should! WARNING: Chances are, once you grow one plant, you’re going to want to grow more. And more. And more. Time for a new feature on This Man’s Kitchen. From now on, Fridays will be for sharing. I’ll list a few food blogs that have caught my attention in the past week. You will then go and enjoy the excellence that they offer. Sounds like a plan? Good. The first share has to go to my friend Karen at Off The (Meat) Hook. We’re old buddies from college. Many memories of drunken dirty Jenga parties and hilarious musicals rest in our heads. It also happens that Karen is an accomplished cook, creating a variety of fantastic recipes both savory & sweet. Her photography is stellar. As an added bonus, Karen reviews restaurants in the most excellent way possible- haiku. Who needs 1,000 words when 17 syllables can say it all? I met the Rum Dood (Matt Robold) at a Foodbuzz featured publishers’ dinner last summer. He writes what might be the most entertaining and informative booze site out there. In fact, Rum Dood was recently awarded that Best Drink Blog on the Well-Fed Network. You’ll find a nice mix of product reviews and cocktail recipes. Perfect reading for a Friday. I have no idea how I didn’t know about this site until today. If you know me, you know my deep love of bacon. Well, imagine my delight when, while viewing the L.A. Times food section, I found a link to Bacon Today. Bacon Obsession is more like it. In a Thanksgiving post, the sites “Chief Baconographer” Corey James took a turducken to a new level of awesome by wrapping it it bacon. “Head Chef” Matt Kirsch brought his own bacon to baconless In-N-Out. All I can think about is bacon now, thanks to these guys. This is some serious stuff. When people speak of food, they often speak of how it makes them feel. It’s a pretty esoteric thing. Rarely do we speak of food in scientific terms. Unless, of course, we are Herve This. This, a French chemist, is (along with Nicholas Kurti) considered the founder of the culinary movement known as Molecular Gastronomy. It’s a scientific approach to food- thinking in terms of physics rather than feelings. For most of us, the phrase “food science” is associated with processed foods. For a select few, though, food science means exactly what is says- the science of food. That is the genius of “Molecular Gastronomy”. Science equals flavor. This, through careful experimentation, investigates the scientific rational behind many culinary theories and myths: Why do we brown meat before stewing? What makes a Spanish Ham so special? Is there a way to perfectly control the texture of a boiled egg? This, being French, also explains wine appreciation though science. The downside to “Molecular Gastronomy” is that it is boring. Very boring, in fact. Unless you get excited by chemical equations, you’re going to have a hard time getting through parts of this book. Happily, there’s a pretty easy solution- skimming! This, true to his scientific background, writes in a very clean and logical form. None of the 101 chapters exceed three pages. So, if all the science begins to hurt your brain, skip non-essential chapters like “Papillary Cells” and “Algal Fibers” in favor of the bits that you find interesting. 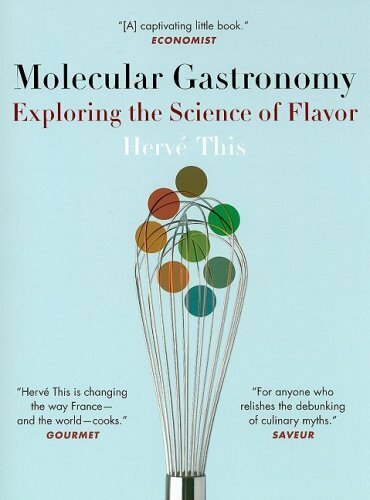 “Molecular Gastronomy” isn’t a must buy. But, if you have some spare time, pop into a bookstore or library, and skim a bit. A knowledgeable cook is a better cook, and the knowledge in this book is something you won’t find anywhere else.